First Jim Hynes and Gary Smith released their new book Saving Face: The Art And History Of The Goalie Mask. Then the Hockey History Blogger listed his Top 10 Goalie Masks Of All Time. 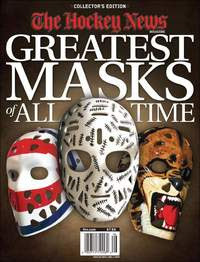 Now here comes The Hockey News with their special interest publication Greatest Masks Of All Time. The issue is available digitally, and will be hitting news stands everywhere soon. The collector's edition magazine is supposed to be on display all NHL season. Keep this new magazine in mind for stocking stuffers!